Foodie Friday: Eating for two. This week’s is a special Foodie Friday blog. It touches on that infamous “eating for two” many, if not all, pregnant woman hear during their pregnancies. Pregnancy brings out the worst in people. Really. It does. Just like with working out, parenting, driving, etc… Suddenly, the day everyone finds out your pregnant, you meet all of the “experts”. So with voices coming at you, at all sides, how do you know what is correct information, and what’s just “expert” advice from those who just kind of need to take a pause, and maybe even back off? First and foremost: Listen to your doctor, your midwife and even your doula if you have one. Second? Stay away from the internet. For real. Those forum boards, chat threads, the endless articles about pregnancy? No. Just don’t even open that browser tab and search for it. Internet “experts” are the same as real life ones. Unless they’ve had the education, the schooling, etc… Take everything anyone tells you with a giant, sparkling grain of salt. I have yet to ask for advice, but man, have I gotten a lot of it. Most have been in regards to my still working out, and my eating habits. It’s really hard to remember that not everyone knows of the studies and research that has been done to prove that exercise during pregnancy not only is okay, but something all doctors are encouraging now. So when I have someone looking at me like I’m about to drop my baby in front of the weight rack at the gym, I have to do my best to not chuckle or make a rude, snide remark. Although, I did have to take that route one evening with a young man that tried to muscle me out of the gym that I have been going to for more than a decade — and he’s a new member. Sorry buddy, not sorry. But the eating one is the one that gets me the most. Should you really be eating for two while pregnant? The American Congress of Obstetricians and Gynecologist say firmly and adamantly, no. It puts you and baby at unnecessary risks. “Oh! You’re supposed to be eating for two! You shouldn’t skip those seconds!” And “Why aren’t you eating that? You have a growing baby in there, you need to eat for two now!”, so on and so forth. 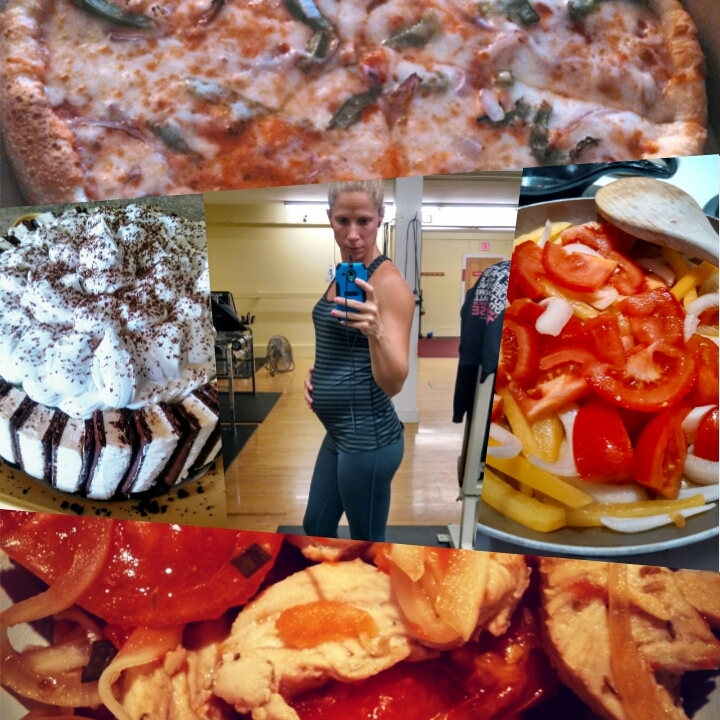 Pre-pregnancy, my caloric intake was 3,300 calories a day. Those calories were consumed in 5 small, very well balanced meals a day. To consume twice that?! I’d be dead before I got the chance to meet my child. I’d smother myself to death consuming 6,600 calories a day, without increasing my activity level to match that intake. Pregnancy isn’t the meal ticket to eat more and eat whatever the hell you want. If that’s your prerogative, so be it. It’s not a healthy one, and it certainly is NOT a smart one. So what is best during pregnancy? Stick with the diet you’re on now. And I don’t mean diet as in what you do to lose weight. I mean diet as in: Eat a well balanced, whole diet of foods rich in nutrients, etc. You should NEVER diet to lose weight during pregnancy. When you’re pregnant, the only thing that should change is how much you eat. During that first trimester, especially if you’re dealing with morning sickness — don’t worry so much about getting a few extra calories. Just focus on getting what your body needs to keep that baby growing and healthy. You’re looking at a 300+ calorie a day consumption. This is on top of what you were consuming pre-pregnancy. That’s right. Only a measly little 300 more calories a day more than what you had before. A far, far cry from the “eat for two” everyone will tell you to do. Except your doctors, nurses, midwives, etc. They’ll tell you DO NOT eat that much. If you and baby are going through a fit pregnancy, then on your gym/workout/run days, you’re definitely going to need to consume a little more than that 300 calories a day extra. That’s where that little plus sign comes in. Keep track of your workouts, monitor what you burn so that you can replenish, and you’re all set. Ideally, a pregnant woman, who was of normal weight pre-pregnancy, should gain about 25-35 pounds during. If she was overweight before pregnancy? Obviously less weight should be gained. More if she was underweight. Another thing often heard during pregnancy is: Give in to those cravings. Baby wants it! Just like without being pregnant, your body is craving that certain “thing” for a reason. No, it’s not because it wants you to pig out on ten hamburgers from Burger King or McDonalds. To spring for the large Blizzard at Dairy Queen instead of that little bite size one they have. Your body is telling you that it’s missing something. Missing, or lacking a nutrient that it needs to get through. That’s where our sweets cravings come from. Most of the time, we get the sweets cravings because our body wants fruit and the nutrients that come with it. NOT that Three Musketeers bar. Babies are the same way. Our body needs more of all of the nutrients we need on a daily basis, and your diet might be lacking in some key spots. Which is where those cravings come in. Finding out what exactly it is that your body is telling you that it needs, can be like deciphering an ancient code some times, but it can be done. That’s not to say that everyone once in awhile you can’t have a burger, some ice cream, a candy bar, etc… But treat it as you would before. No, it’s not a reward for behaving well on your diet. No, it’s not meant to be a treat or a cheat. Indulge, lightly, once in awhile. That’s how you stay on track with your healthy eating. Don’t deprive, but sample and don’t dive right on in either. A few bites once in awhile is okay. Brings me back to what Jill Coleman once said on sampling: taste everything and binge on nothing. In the end, eating right and exercising will not only help you get back into shape easier and even faster, but it will help you in that delivery room as well. Workout Wednesday: Group Fitness Classes. Pressed for time & space? Quick shoulders & back.